Note for the reader: Our story comes from a single parent in his 50s, whose identity we are protecting. Dear Contributor: Thank you for your courage, for sharing your story with us. I am 53 years of age, a single parent, and have a wonderful family of 2 young men as my kids. I have been diagnosed with Type 2 Bipolar disorder. I was not aware of it until 3 years ago. In the course of my therapy, I also discovered (through dialogue with my therapist) that my father suffered from Bipolar 1 disorder. I recognise the symptoms in hindsight through my research. 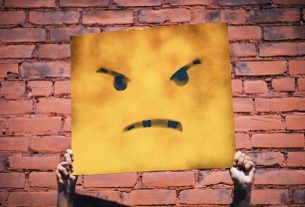 My late wife suffered from “Paranoid Personality disorder”, again discovered in the course of my dialogue with the therapist. It was a good marriage, but replete with a lot of pain due to my wife being rabidly suspicious of her relatives and friends and gradually breaking ties and leading a life sans friends and relatives. I followed suit, as my basic personality also was demanding the same. So here I am, happy and sad at the same time being cut off from friends and relatives, happy to lead a life in isolation. Throughout my childhood and young adulthood, I was perennially feeling low, with bouts of mild hyperactivity (and the attendant promiscuity in pre-marriage adulthood) where I was very efficient and felt like a superhuman. It continues. The tipping point occurred about 3 years ago, when I went into a super low depressed phase, and being a single parent to 2 bright young boys, it was extremely hard on them. Having lost my wife, the love of my life 6 years ago, and seeing her suffer horribly in the last stages of debilitating cancer, and pass away in the ICU before my eyes, it only accentuated my condition. 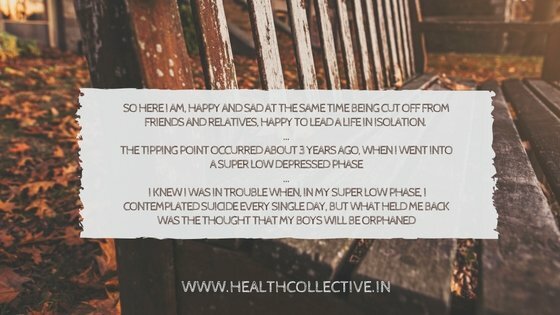 I knew I was in trouble when, in my super low phase, I contemplated suicide every single day, but what held me back was the thought that my boys will be orphaned. The next thought was –- can I kill them both and then kill myself? I worked out scenarios – throwing them off the roof, crashing the car with all 3 of us in it. I did do it once, but the impact was not enough because I chickened out at the last minute. Fortunately, although the car was a mess, all 3 of us did not sustain any injuries. It was then that I reached out to my sister in the US. Her advice –- get hold of a therapist. Lilavati hospital – the doctor was really good. He gave me medication to “compress my mind” in a narrow band. Lithium to prevent exaggerated feeling, and an anti-depressant for tackling the lows. The medication worked but took a toll on my physical self. Muscle failure, sleeplessness, frayed nerves, etc. After a couple of years, I weaned off the medication, and I keep a journal of feelings, and am able to recognise the danger points, and take behavioural interventions. Alcohol is my companion, but I keep it in control. I am blessed with 2 wonderful young men (kids) aged 21 and 16 who are aware of my condition and they are my therapists and port of refuge. My next concern is what after they strike out on their own? I do not want to be a burden on them and their future wives. They should lead a life of their own. How do I manage in future? My thoughts are -– Dear God, keep me alive until my boys are settled into a job and family life, and then take me away from here. I stay away from medication, but have a stock for SOS. MDD XR, Prestiq, Licab, etc. etc. I have had enough of them. No more for me. In my “mild manic phase” I go online on dating / matrimonial websites and approach women boldly, and sometimes make a fool of myself. Depression, loneliness, the occasional hyperactivity, all phases I need to manage and control. Oh, the loneliness — during this low phase I really really crave for a partner. However, I also need to be a good example to my boys so I have to keep my urges under control. My manic phases can be very dicey — Every woman seems soooo desirable, and “gettable / obtainable” I feel like Superman, and all women are mine. Then, the thought of setting a good example for my boys butts in, and that’s what helps me control my feelings. In my depressive phase, and they are longer than the “highs”, it is debilitating –- sooooooo difficult to work, interact with others. I have confided in my boss, and he understands my situation, so that’s a relief. Twitter has offered me an outlet. Personal interaction is difficult for me, but online I am more at ease and comfortable (relatively). I have put down my thoughts as they have appeared in my mind. This is my constant state of mind. To have a psychological condition is itself a curse – in addition to have gone through personal loss is all the more burdensome. I take each day – one day at a time. Tomorrow is another day, I will deal with it as it unfolds. I feel caged, chained, a prisoner – and remember Eagles’ song “Desperado – “Your prison is walking through this world all alone”! 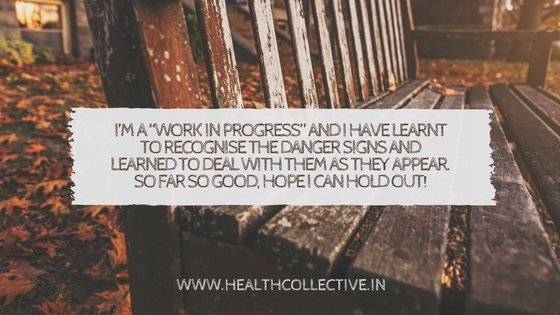 I’m a “work in progress” and I have learnt to recognise the danger signs and learned to deal with them as they appear. So far so good, hope I can hold out! I’m a good person, I am not bad, this is what I am, I live with it daily. 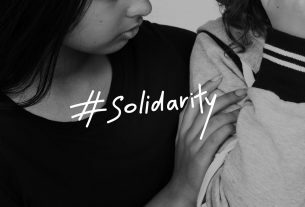 *The Health Collective aims to be a safe space for conversations, as we collectively look to raise awareness, deal with the stigma, and let people know they’re not alone. 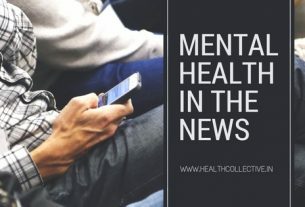 You will find a roll-call of mental health experts across India here (updating on a rolling basis). We also have an open call for those of you who want to share your story. Is India Ready to Tackle a Mental Health Crisis?